Homer describes a more-than-natural light around the heads of heroes in battle. Depictions of Perseus in the act of slaying Medusa, with lines radiating from his head, appear on a white-ground toiletry box in the Louvre and on a slightly later red-figured vase in the style of Polygnotos, ca. 450-30 BC, in the Metropolitan Museum of Art. On painted wares from south Italy, radiant lines or simple haloes appear on a range of mythic figures: Lyssa, a personification of madness; a sphinx; a sea demon; and Thetis, the sea-nymph who was mother to Achilles. The Colossus of Rhodes was a statue of the sun-god Helios and had his usual radiate crown (copied for the Statue of Liberty). Hellenistic rulers are often shown wearing radiate crowns that seem clearly to imitate this effect. The halo and the aureola have been widely used in Indian art, particularly in Buddhist iconography where it has appeared since at least the 1st century AD; the Kushan Bimaran casket in the British Museum is dated 60AD (at least between 30BC and 200AD). The rulers of the Kushan Empire were perhaps the earliest to give themselves haloes on their coins, and the nimbus in art may have originated in Central Asia and spread both east and west. In Chinese and Japanese Buddhist art the halo has also been used since the earliest periods in depicting the image of Amitabha Buddha and others. Tibetan Buddhism uses haloes and aureoles of many types, drawing from both Indian and Chinese traditions, extensively in statues and Thangka paintings of Buddhist saints such as Milarepa and Padmasambhava and deities. Different coloured haloes have specific meanings: orange for monks, green for the Buddha and other more elevated beings, and commonly figures have both a halo for the head, and another circular one for the body, the two often intersecting somewhere around the head or neck. Thin lines of gold often radiate outwards or inwards from the rim of the halo, and sometimes a whole halo is made up of these. In India the head halo is called Prabhamandala or Siras-cakra, while the full body halo is Prabhavali. Elaborate haloes and especially aureoles also appear in Hindu sculpture, where they tend to develop into architectural frames in which the original idea can be hard to recognise. 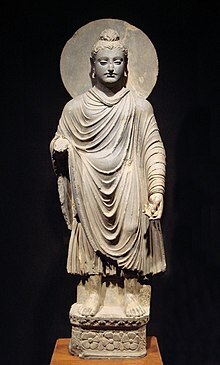 Theravada Buddhism and Jainism did not use the halo for many centuries, but later adopted it, though less thoroughly than other religious groups. In Asian art, the nimbus is often imagined as consisting not just of light, but of flames. This type seems to first appear in Chinese bronzes of which the earliest surviving examples date from before 450. The depiction of the flames may be very formalized, as in the regular little flames on the ring aureole surrounding many Chola bronzes and other classic Hindu sculptures of divinities, or very prominent, as with the more realistic flames, and sometimes smoke, shown rising to a peak behind many Tibetan Buddhist depictions of the "wrathful aspect" of divinities, and also in Persian miniatures of the classic period. This type is also very rarely found, and on a smaller scale, in medieval Christian art. [page needed] Sometimes a thin line of flames rise up from the edges of a circular halo in Buddhist examples. In Tibetan paintings the flames are often shown as blown by a wind, usually from left to right. Halos are found in Islamic art from various places and periods, especially in Persian miniatures and Moghul and Ottoman art influenced by them. Flaming halos derived from Buddhist art surround angels, and similar ones are often seen around Muhammad and other sacred human figures. From the early 17th century, plainer round haloes appear in portraits of Mughal Emperors and subsequently Rajput and Sikh rulers; despite the more local precedents art historians believe the Mughals took the motif from European religious art, though it expresses a Persian idea of the God-given charisma of kingship that is far older. The Ottomans avoided using halos for the sultans, despite their title as Caliph, and they are only seen on Chinese emperors if they are posing as Buddhist religious figures, as some felt entitled to do. The Kushan Kanishka casket of 127, with (left to right) Brahma, the Buddha and Indra. The halo represents an aura or the glow of sanctity which was conventionally drawn encircling the head. It first appeared in the culture of Hellenistic Greece and Rome, possibly related to the Zoroastrian hvarena – "glory" or "divine lustre" – which marked the Persian kings, and may have been imported with Mithraism. Though Roman paintings have largely disappeared, save some fresco decorations, the haloed figure remains fresh in Roman mosaics. In a 2nd-century AD Roman floor mosaic preserved at Bardo, Tunisia, a haloed Poseidon appears in his chariot drawn by hippocamps. Significantly, the triton and nereid who accompany the sea-god are not haloed. In a late 2nd century AD floor mosaic from Thysdrus, El Djem, (illustration) Apollo Helios is identified by his effulgent halo. Another haloed Apollo in mosaic, from Hadrumentum, is in the museum at Sousse. The conventions of this representation, head tilted, lips slightly parted, large-eyed, curling hair cut in locks grazing the neck, were developed in the 3rd century BC to depict Alexander the Great (Bieber 1964; Yalouris 1980). Sometime after this mosaic was executed, the Emperor began to be depicted with a halo, which was not abandoned when they became Christian; initially Christ only had one when shown on a throne as Christ in Majesty. Early pre-4th century Mosaic of Sol Invictus in Mausoleum M in the pre-4th-century necropolis beneath St Peter's Basilica – interpreted by many as representing Christ. The halo was incorporated into Early Christian art sometime in the 4th century with the earliest iconic images of Christ, initially the only figure shown with one (together with his symbol, the Lamb of God). Initially the halo was regarded by many as a representation of the Logos of Christ, his divine nature, and therefore in very early (before 500) depictions of Christ before his Baptism by John he tends not to be shown with a halo, it being a matter of debate whether his Logos was innate from conception (the Orthodox view), or acquired at Baptism (the Nestorian view). At this period he is also shown as a child or youth in Baptisms, though this may be a hieratic rather than an age-related representation. Nativity and Transfiguration of Christ, with cross haloes; the apostles, angels and prophets have plain ones. (1025–50, Cologne). A cruciform halo, that is to say a cross within, or extending beyond, a halo is used to represent the persons of the Holy Trinity, especially Jesus, and especially in medieval art. In Byzantine and Orthodox images, inside each of the bars of the cross in Christ's halo is one of the Greek letters Ο Ω Ν, making up ὁ ὢν—"ho ōn", literally, "the Existing One"—indicating the divinity of Jesus. At least in later Orthodox images, each bar of this cross is composed of three lines, symbolising the dogmas of the Trinity, the oneness of God and the two natures of Christ. In mosaics in Santa Maria Maggiore (432-40) the juvenile Christ has a four-armed cross either on top of his head in the radius of the nimbus, or placed above the radius, but this is unusual. In the same mosaics the accompanying angels have haloes (as, in a continuation of the Imperial tradition, does King Herod), but not Mary and Joseph. Occasionally other figures have crossed haloes, such as the seven doves representing the Seven gifts of the Holy Spirit in the 11th century Codex Vyssegradensis Tree of Jesse (where Jesse and Isaiah also have plain haloes, as do the Ancestors of Christ in other miniatures). Beatified figures, not yet canonised as saints, are sometimes shown in medieval Italian art with linear rays radiating out from the head, but no circular edge of the nimbus defined; later this became a less obtrusive form of halo that could be used for all figures. Mary has, especially from the Baroque period onwards, a special form of halo in a circle of twelve stars, derived from her identification as the Woman of the Apocalypse. Square haloes were sometimes used for the living in donor portraits of about 500-1100 in Italy; Most surviving ones are of Popes and others in mosaics in Rome, including the Episcopa Theodora head of the mother of the Pope of the day. They seem merely an indication of a contemporary figure, as opposed to the saints usually accompanying them, with no real implication of future canonization. A late example is of Desiderius, Abbot of Monte Cassino, later Pope, from a manuscript of 1056–86; Pope Gregory the Great had himself depicted with one, according to the 9th-century writer of his vita, John, deacon of Rome. A figure who may represent Moses in the 3rd century Dura Europos Synagogue has one, where no round halos are found. Personifications of the Virtues are sometimes given hexagonal haloes. Scalloped haloes, sometimes just appearing as made of radiating bars, are found in the manuscripts of the Carolingian "Ada School", such as the Ada Gospels. The whole-body image of radiance is sometimes called the 'aureole' or glory; it is shown radiating from all round the body, most often of Christ or Mary, occasionally of saints (especially those reported to have been seen surrounded by one). Such an aureola is often a mandorla ("almond-shaped" vesica piscis), especially around Christ in Majesty, who may well have a halo as well. In depictions of the Transfiguration of Jesus a more complicated shape is often seen, especially in the Eastern Orthodox tradition, as in the famous 15th century icon in the Tretyakov Gallery in Moscow. In the early 15th century Jan van Eyck and Robert Campin largely abandoned their use, although some other Early Netherlandish artists continued to use them. In Italy at around the same time, Pisanello used them if they did not clash with one of the enormous hats he liked to paint. Generally they lasted longer in Italy, although often reduced to a thin gold band depicting the outer edge of the nimbus, usual for example in Giovanni Bellini. Christ began to be shown with a plain halo. Fra Angelico, himself a monk, was a conservative as far as haloes are concerned, and some of his paintings demonstrate the problems well, as in several of his more crowded compositions, where they are shown as solid gold disks on the same plane as the picture surface, it becomes difficult to prevent them obstructing other figures. At the same time they were useful in crowded narrative scenes for distinguishing the main, identifiable, figures from the mass of a crowd. Giotto's Lamentation of Christ from the Scrovegni Chapel has eight figures with haloes and ten without, to whom the viewer knows they are not meant to attach a specific identity. 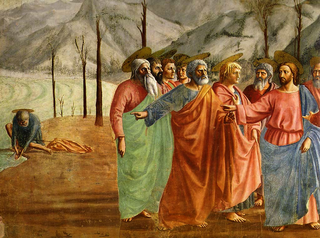 In the same way, a Baptism of Christ by Perugino in Vienna gives neither Christ nor John the Baptist haloes, as sufficiently recognisable without them, but a saint in the background, not usually present in this scene, has a ring halo to denote his status. In the High Renaissance, even most Italian painters dispensed with haloes altogether, but in the Church's reaction to the Protestant Reformation, that culminated in the decrees on images of the Council of Trent of 1563, their use was mandated by clerical writers on religious art such as Molanus and Saint Carlo Borromeo. Figures were placed where natural light sources would highlight their heads, or instead more discreet quasi-naturalistic flickering or glowing light was shown around the head of Christ and other figures (perhaps pioneered by Titian in his late period). Rembrandt's etchings, for example, show a variety of solutions of all of these types, as well as a majority with no halo effect at all. The disk halo was rarely used for figures from classical mythology in the Renaissance, although they are sometimes seen, especially in the classical radiant form, in Mannerist and Baroque art. By the 19th century haloes have become unusual in Western mainstream art, although retained in iconic and popular images, and sometimes as a medievalising effect. When John Millais gives his otherwise realist St Stephen (1895) a ring halo, it seems rather surprising. In popular graphic culture, a simple ring has become the predominant representation of a halo since at least the late 19th century, as seen for example in the logo for the Simon Templar ("The Saint") series of novels and other adaptations. The early Church Fathers expended much rhetorical energy on conceptions of God as a source of light; among other things this was because "in the controversies in the 4th century over the consubstantiality of the Father and the Son, the relation of the ray to the source was the most cogent example of emanation and of distinct forms with a common substance" – key concepts in the theological thought of the time. Gospels of Tsar Ivan Alexander of Bulgaria, 1355–56; the whole royal family have haloes. Giotto Scrovegni Chapel, 1305, with flat perspectival haloes; the view from behind causes difficulties, and John's halo has to be reduced in size. The risen Christ appearing to the Eleven (Luke 24,36-49) from Duccio's Maestà. Christ has a plain halo; the Apostles only have them where they will not seriously interfere with the composition. The Lutheran Hans Leonhard Schäufelein shows only Christ with a halo in this Last Supper of 1515. In Simon Ushakov's icon of The Last Supper (1685) eleven of the twelve apostles have haloes: only Judas Iscariot does not. The distinction between the alternative terms in English is rather unclear. The oldest term in English is "glory", the only one available in the Middle Ages, but now largely obsolete. It came from the French "gloire" which has much the same range of meanings as "glory". "Gloriole" does not appear in this sense until 1844, being a modern invention, as a diminutive, in French also. "Halo" is first found in English in this sense in 1646 (nearly a century after the optical or astronomical sense). Both "halos" and "haloes" may be used as plural forms, and halo may be used as a verb. Halo comes originally from the Greek for "threshing-floor" – a circular, slightly sloping area kept very clean, around which slaves or oxen walked to thresh the grain. In Greek, this came to mean the divine bright disk. Nimbus means a cloud in Latin and is found as a divine cloud in 1616, whereas as "a bright or golden disk surrounding the head" it does not appear until 1727. The plural "nimbi" is correct but "rare"; "nimbuses" is not in the OED but sometimes used. "Nimb" is an obsolete form of the noun, but not a verb, except that the obsolete "nimbated", like the commoner "nimbate", means "furnished with a nimbus". It is sometimes preferred by art-historians, as sounding more technical than halo. "Aureole", from the Latin for "golden", has been used in English as a term for a gold crown, especially that traditionally considered the reward of martyrs, since the Middle Ages (OED 1220). But the first use recorded as a term for a halo is in 1848, very shortly after which matters were greatly complicated by the publication in 1851 of the English translation of Adolphe Napoléon Didron's important Christian Iconography: Or, The History of Christian Art in the Middle Ages. This, by what the OED calls a "strange blunder", derived the word from the Latin "aura" as a diminutive, and also defined it as meaning a halo or glory covering the whole body, whilst saying that "nimbus" referred only to a halo around the head. This, according to the OED, reversed the historical usage of both words, but whilst Didron's diktat was "not accepted in France", the OED noted it had already been picked up by several English dictionaries, and influenced usage in English, which still seems to be the case, as the word "nimbus" is mostly found describing whole-body haloes, and seems to have also influenced "gloriole" in the same direction. The only English term that unequivocally means a full-body halo, and cannot be used for a circular disk around the head is "mandorla", first occurring in 1883. However, this term, which is the Italian word for "almond", is usually reserved for the vesica piscis shape, at least in describing Christian art. In discussing Asian art, it is used more widely. Otherwise, there could be said to be an excess of words that could refer to either a head-disk or a full-body halo, and no word that clearly denotes a full-body halo that is not vesica piscis shaped. "Halo" by itself, according to recent dictionaries, means only a circle around the head, although Rhie and Thurman use the word also for circular full-body aureoles. ^ Harper, Douglas. "halo". Online Etymology Dictionary. ἅλως. Liddell, Henry George; Scott, Robert; A Greek–English Lexicon at the Perseus Project. ^ "halo – art". britannica.com. ^ a b c "Metropolitan Museum of Art: Art of South Asia" (PDF). metmuseum.org. ^ Ramsden, E. H. (1941). "The Halo: A Further Enquiry into Its Origin". The Burlington Magazine for Connoisseurs. 78 (457): 123–131. JSTOR 868232. ^ "Illustration". Archived from the original on 8 July 2008. ^ "CATHOLIC ENCYCLOPEDIA: Nimbus". www.newadvent.org. ^ "Early Christian Symbols" (PDF). Catholic Biblical Association of Canada. Archived from the original (PDF) on 23 December 2011. Retrieved 20 September 2011. ^ only in Italy, according to Didron, Vol 2 p.79. ^ Becklectic, made by photographer. "Joshua. Fresco from the Dura Europos synagogue (Jewish Art, ed. Cecil Roth, Tel Aviv: Massadah Press, 1961, cols. 203-204: "Joshua")" – via Wikimedia Commons. ^ Tate. "'Saint Stephen', Sir John Everett Millais, Bt, 1895 – Tate". tate.org.uk. Didron, Adolphe Napoléon, Christian Iconography: Or, The History of Christian Art in the Middle Ages, Translated by Ellen J. Millington, H. G. Bohn, (Original from Harvard University, Digitized for Google Books) – Volume I, Part I (pp. 25–165) is concerned with the halo in its different forms, though the book is not up to date. Wikimedia Commons has media related to Halo (religious iconography).